Our lungs are just as important to our body as our heating and air conditioning is to our homes. We take our homes ventilation system for granted until they are not working, and then we have a serious problem if we have no heat in the winter or if it gets overly hot in the summer. Maintaining these systems would be the best solution. Our lungs are responsible for our body’s ventilation pulling air in then out as we breathe. Our lungs bring in oxygen and then push out carbon dioxide without us thinking about it but we do need to take care of our lungs so they keep doing this for us without problems! Our nose and mouth acts as the parts of the body that actually helps us to get the air into our body. Just like in our homes we have vents that keep larger pieces of debris out of our ventilation system, the nose acts as our body’s vents or air filters. Small particles or toxins can manage to get into your lungs causing problems. So when these bacteria, viruses and other particles make it into your lungs you are equipped with natural defenses that help you to sneeze, cough or blow them out. But some of these particles get past our defenses and cause inflammatory reactions that can destroy parts of our lungs causing various lung disorders which are listed later in this article. As you can see in the diagram we have two lungs on either side of our chest that are made up of spongy type tissue that expands and contracts each time we take a breath. 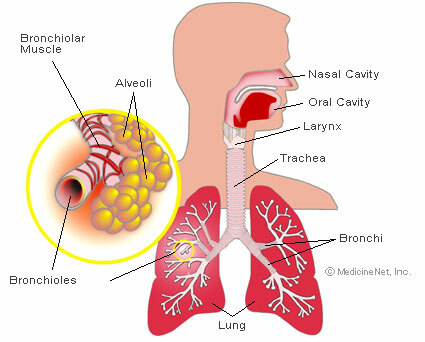 The windpipe (trachea) takes the inhaled air we breathe and passes it through the branches (bronchi) that are then divided into smaller branches (bronchioles) into the lungs. The bronchioles end in microscopic clusters of air sacs (alveoli) that then take the air where it is absorbed into the blood. Then in reverse the carbon dioxide which is a waste product of metabolism travels from the blood to the alveoli where it can be breathed out. As I said before we live so we breathe but without breathing we will not live! During our lifetime we take in with each breath enough air to fill 10 million balloons. Since not all the air we breathe in is good air we are equipped with a cleaning system. The bronchial tubes do the regular cleaning for our lungs as they are covered in mucus so that dirt and germs stick to it. We also have millions of tiny hairs in our lungs called cilia which act like sweepers taking away the stuff that is caught in the mucus. A very important note here is that cigarette smoke kills the cilia, meaning you have destroyed your lung’s mechanism that protects it from toxins! Chronic obstructive pulmonary disease (COPD): Damage to the lungs results in difficulty blowing air out, causing shortness of breath. Smoking is by far the most common cause. Emphysema: A form of COPD usually caused by smoking. The fragile walls between the lungs’ air sacs (alveoli) are damaged, trapping air in the lungs and making breathing difficult. Bronchitis: Repeated, frequent episodes of productive cough, usually caused by smoking. Breathing also becomes difficult in this form of COPD. Pneumonia: Infection in one or both lungs. Bacteria are the most common cause. Asthma: The lungs’ airways (bronchi) become inflamed and can spasm, causing shortness of breath and wheezing. Allergies, viral infections, or air pollution often trigger asthma symptoms. Sarcoidosis: Tiny areas of inflammation can affect all organs in the body, with the lungs involved most of the time. Bronchiectasis: The airways (bronchi) become inflamed and expand abnormally, usually after repeated infections. Coughing, with large amounts of mucus, is the main symptom. Lymphangioleiomyomatosis (LAM): A rare condition in which cysts form throughout the lungs, causing breathing problems similar to emphysema. Interstitial lung disease: A collection of conditions in which the interstitium (lining between the air sacs) becomes diseased. Fibrosis (scarring) of the interstitium eventually results. Lung cancer: Cancer may affect almost any part of the lung. Most is caused by smoking. Acute respiratory distress syndrome (ARDS): Severe, sudden injury to the lungs caused by a serious illness. Life support with mechanical ventilation is usually needed to survive. Pertussis (whooping cough): A highly contagious infection of the airways (bronchi) by Bordetella pertussis, causing a persistent cough. How can we take better care of our Respiratory System? Learn to breathe deeply from deep down and then breathe out fully. This will help the nitric oxide that is found in your nasal passages get to your lungs which in turn makes your lungs and blood vessels function better. It will also help to drain your lymphatic system which removes toxins from your body. Take this test: either run up a flight of stairs or walk briskly for 1 ½ km – if you can do either of these without having to stop to rest then your lungs are in good order – if you cannot do this then you need to start working on being able to do it by increasing the distance each day until you can. This should be part of your weekly routine that will help to keep you in good shape. Do your exercise in a park where plants are giving out good pure oxygen so you are breathing good quality air. And the plants will take away the pollutants from the air. Decrease the toxins in your own space – remove chemical cleaners and other toxic substances from your home, garage, basement and workplace. Keep your windows open all year so you allow the toxins to escape. But while driving on a highway keep your windows closed to keep out the fumes. Clean out the filter in your furnace and buy an air cleaner if possible. Also a new pillow each year will help since you are breathing in the mites that form on a pillow over time each night. If you are a smoker, QUIT SMOKING or if you live with one, encourage them to quit or at least smoke outside so you too will not be inhaling the smoke that can kill you both! When I was a young girl my mother would make this wonderful chocolate fudge dessert cake and I was always amazed how it would start with you pouring hot water over a cake batter but it would come out with a light and fluffy cake with a deep chocolate fudge sauce at the bottom. I have improved the ingredients for you today to make it gluten free and healthier. Even though it is a bit heavier, it still has that wonderful hot chocolate tasting fudge syrup that will delight all chocolate lovers! Just a reminder that this is a special occasion dessert, not something we would have often. Mix until moist then put into your 8” cake pan that has been greased with some coconut oil. Then pour 1¾ cups boiled water over everything and bake at 350F for 40 minutes. 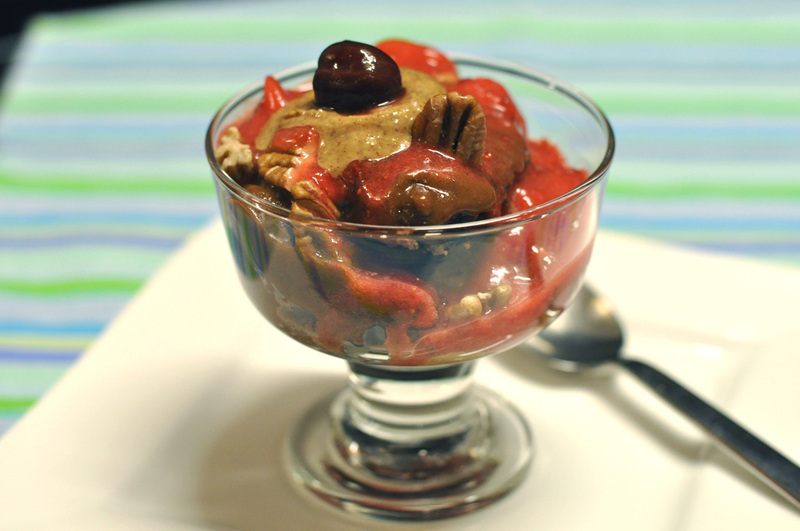 Once baked layer with pecans, almond butter and pureed berries as we have in the picture. Organic Essential Protein is an unsweetened blend of organic protein powders from dry peas and rice along with organic raw seeds that are high in protein and minerals. Organic Essential Protein is ideal for anyone with an active, outdoors, stay-fit lifestyle, and is especially suited for vegetarians, vegans and anyone moving towards a more plant-based diet that wants to add more protein to their diet. Organic Protein is 100% plant-based from carefully selected and tested sources, so there are no concerns from animal-source protein and no concerns about harmful exposure to environmental toxins. Worry free, delicious, and good for you.